What is the Tsushima leopard cat? 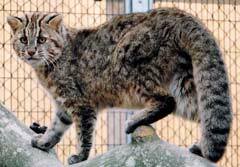 The Tsushima leopard cat is an endangered wildcat inhabiting Tsushima islands, Nagasaki prefecture. It is regarded as a subspecies of the leopard cat and is thought to have arrived in Tsushima from the Asian continent about 100,000 years ago. 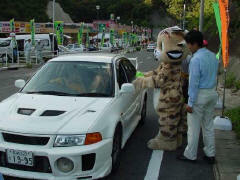 The population of the Tsushima leopard cat has been declining mainly due to habitat degradation and road kills. It was designated by the Japanese government as a National Nature Monument in 1971 and as a National Endangered Species in 1994. A conservation project plan was established in 1995 to protect the species, under the direction of the Ministry of the Environment in conjunction with other government agencies. Tsushima leopard cats use these environments as foraging areas and resting sites. They are more active from sunset through dawn. 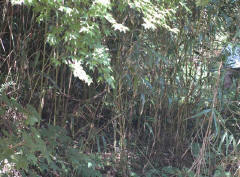 Glossy-leaved forest is the essential habitat for the Tsushima leopard cat. 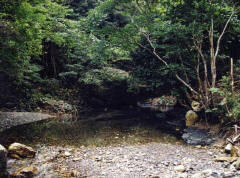 They often use streams, forest edges, and mountain slopes in relatively lower altitudes (below 200m). 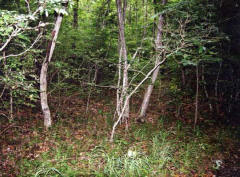 They are also found in cultivated areas and even near houses. 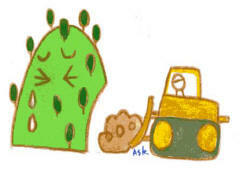 They prefer to stay where quality of the natural environment remains high. Ecological research using radio-tracking methods have revealed that adult females usually establish a home range of approximately 2km2 and tend to stay in the same area throughout the year. On the other hand, adult males have a larger home range and the size fluctuates seasonally; it can become 7 to 8 times larger than the adult female’s home range size, especially in winter due to the mating season. 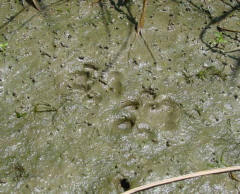 Tsushima leopard cats are rarely seen due to their cautious nature; nevertheless, we are able to find evidence of their existence in the field such as footprints and feces. Round shaped footprints with four finger pads, and with no claw marks. 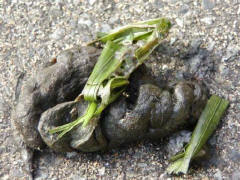 Fur and bones of mice, feathers of birds, and other prey are usually found in feces. 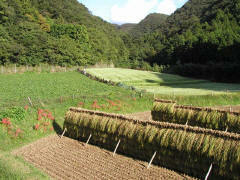 Often, they contain grasses. The reproductive biology of the Tsushima leopard cat is not fully understood; however, their mating season is thought to occur during February and March. After about two months of gestation, one to three kittens are born in March and April. Kittens become independent from the parents when they become six to seven months old. In the 1960s, the population size was estimated to be between 250 and 300 animals. 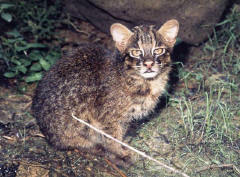 The latest research conducted from 2002 to 2004 shows that the population has decreased to around 80-110 animals, suggesting that the population size and distribution of the Tsushima leopard cat is declining. 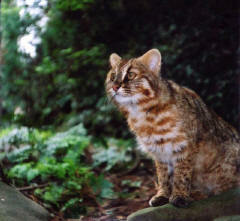 Recent evidence suggests that the leopard cat has completely disappeared from Shimojima, the south island. Mice form the main part of the leopard cat diet, and are eaten throughout the year. 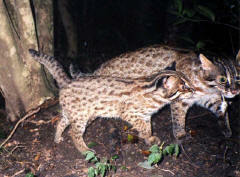 In addition to mice, leopard cats are likely to eat birds during the winter months, and insects in the summer months. 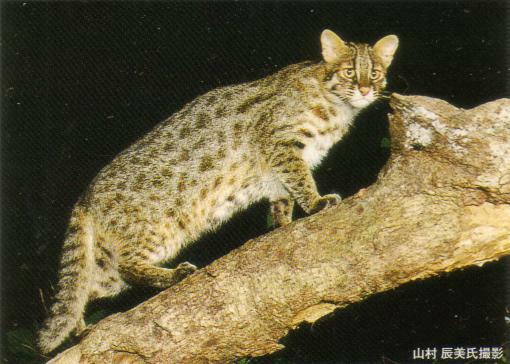 There are two wildcats in Japan: the Tsushima leopard cat, and Iriomote cat living on the island of Iriomote in Okinawa prefecture. Other than the Tsushima leopard cat, there are several kinds of mammals such as Tsushima deer, Tsushima martens, and Korean weasels. 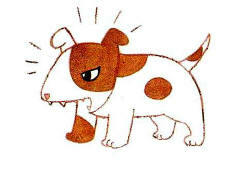 There are no raccoon dogs, foxes, or rabbits, which are common in mainland Japan. 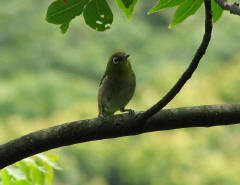 Much of the fauna in Tsushima is unique to the island. 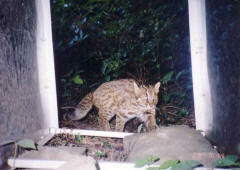 The Ministry of the environment designated the Tsushima leopard cat as a National Endangered Species in March 1994 and has ever since been conducting conservation activities based on a government conservation project plan. Biological research has been conducted; for example, radio-transmitters are used to track and understand their behavior and ecology. 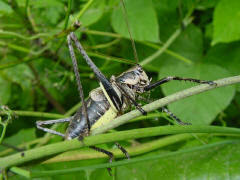 Also long term research is conducted to monitor their population and distribution change. A forest restoration project is being undertaken by a local volunteer group, and a feral cat management program is being overseen by a local committee. A captive breeding program was initiated in Fukouka Zoo to establish a self-sustaining population in captivity, with the ultimate aim of reintroducing the captive bred animals back to the wild in Tsushima. Since the birth of the first kitten in April 2000, the captive population has been growing successfully. 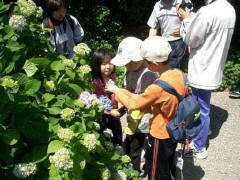 A variety of events such as guided field tours and lectures about the wildlife of Tsushima are regularly held. 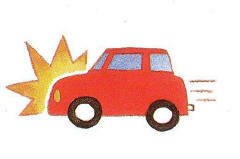 Also, a campaign to stop road kills is conducted every year. Our consideration and behavior will make a difference. 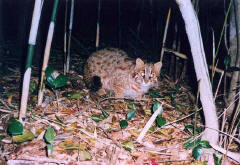 One of our conservation goals is to ensure that society can coexist with the Tsushima leopard cat. 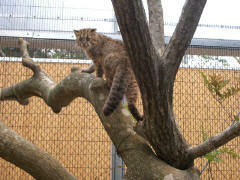 The Tsushima leopard cat is about the same size as a domestic cat. Weight: 3-5kgs, Length: 70-80cm. 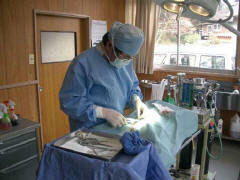 Females are slightly smaller than males. 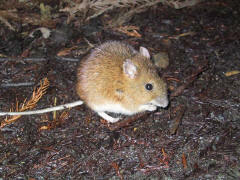 They have a fat tail, and the body color is chestnut-brown to cream with indistinct brown spots. 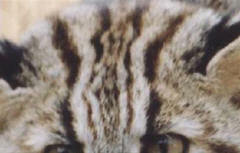 You can find a white spot on the back of each ear and a clear brown-white striped pattern on the forehead, the characteristic features of wildcats. 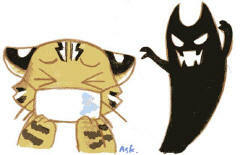 How you can distinguish the Tsushima leopard cat from the domestic cat. There are many feral (domestic) cats living in Tsushima other than leopard cats. Since feral cats are often found within the habitat of the Tsushima leopard cat, it is important to know how to distinguish the two from each other. 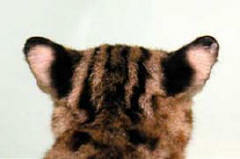 The most significant visible difference is that the Tsushima leopard cat has a white spot on the back of each ear, and the domestic cat does not. Therefore, if you see a cat in the wild with white spots of the back of its ears, you can be pretty certain that you have seen a Tsushima leopard cat! If you have had a chance to see the Tsushima leopard cat (dead or alive), please contact us!